Chocolate and Valentine’s Day Candy go hand in hand. So it’s only natural that chocolate lovers LOVE Valentine’s Day! We have three chocolate treats that you might not have thought of for your Valentine. First, if your chocolate lover likes caramel with their chocolate, then these Hershey’s chocolate caramel hearts are perfect for them. They are the classic Hershey’s chocolate shaped as a heart and filled with a little caramel. Is your Valentine just as much a fan a peanut butter as they are chocolate? Then these Reese’s Peanut Butter Hearts are just for them. There are 36 individually wrapped hearts, so your sweetheart can take them wherever their heart takes them. Finally, have a valentine who just loves a classic bar of milk chocolate? Then this 5lb Hershey’s bar is sure to please! They’ll have enough for snacking and baking, so it’s sure to be a hit. 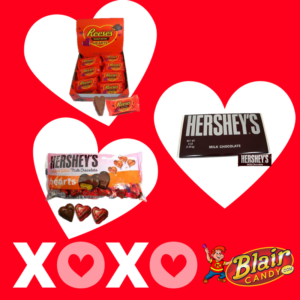 No matter what their tastes are, be sure to order their Valentine’s Day candy soon so it arrives in time! Shop BlairCandy.com now for more!